Join us in the Gallery for Vermont author Katharine Britton discussing her two novels, Little Island and Her Sister's Shadow. 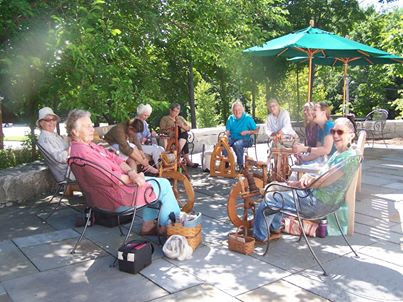 The NH Spinners and Dyers Guild present a day of Spinning in the Jim Mitchell Community Park - spin, watch, learn, play, eat! Join the first speaker in this series, US Senator for Vermont, Bernie Sanders. Bernie Sanders was elected to the U.S. Senate in 2006 after serving 16 years in the House of Representatives. He is the longest serving independent member of Congress in American history. He is also the author of The Speech: a Historic Filibuster on Corporate Greed and the Decline of Our Middle Class and the autobiographical Outsider in the House. Meet Adi Rule, NH native and author of the newest popular Young Adult novel, Strange Sweet Song. listen to the small voice inside and be still. Melissa Laverack is a certified MBSR teacher and Quaker seeking to share her practice with neighbors. Melissa will be happy to facilitate, and is open to others stepping in to keep the energy moving.